Your vacation condo sits near the shores of Gull Lake with close by June Lake marina and nearby Yosemite National Park. Enjoy fishing for trophy trout or hike one of the famous Sierra Nevada Mountain trails. 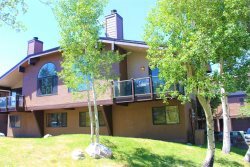 A June Lake Interlaken vacation condo located close to everything you and your family or small group plan to do in June Lake, California. Great fishing spots are all over the place with high sierra lakes and creeks with plentiful trout. Interlaken condos are right on the shores of Gull lake, known for excellent fishing. Fish along Rush Creek, Silver Lake, Grant Lake, Gull Lake and, of course, June Lake. There is biking, boating, sightseeing, and hiking. A short five minute drive will take you to the Rush Creek Trail head where you can access Agnew, Gem and Waugh Lakes. So much to explore from Yosemite National Park, to the many natural hot springs, or even just a sunset dinner at the Whoa Nellie Deli overlooking Mono Lake. When the leaves change the June Lake area becomes alive with fall color, a photographers dream! Make sure you also stay to see this area in the winter, it becomes magical. Only a two minute drive to the open slopes of June Mountain Ski Area and 20 minutes to the world famous Mammoth Mountain Ski Area. Every season has something new for you and your family to discover and this condo is the perfect cozy place to gather. Enter this great condo on the main gathering floor. The entry hall (with plenty of storage) starts with a full bath, then a bedroom with a queen and twin bed. Just a few steps down the hall is a wet bar and fully equipped kitchen as well as a washer and dryer. From the kitchen, view the dining room and living room with a cozy, easy to use, wood burning fireplace and great views of Gull Lake and Sierra passes. The dining room and great room access the deck with a BBQ. The kitchen counter seats 5 and the dining room table seats 6. The great room is spacious and comfortable with a 45" LCD flat screen, full Internet access, CD audio system, and DVD Blu-ray player. From the great room head downstairs to three more bedrooms. The large master bedroom has a king sized bed and also a sitting area. Relaxing is made easy in this room with stunning Sierra views, private deck, electric wall fireplace, 32" TV, and Blu-ray DVD player. The master bath has a jet tub, separate shower, and plenty of room. The other two bedrooms are downstairs and a full bathroom with hall access. One has a queen and twin bed and the other has a full bed, writing desk, and separate entrance. This condo is very easy to access with just a short ramp. Sierra was very helpful with the process. Our large group has been coming to June Lake for decades and Interlaken Condos is a definite upgrade over our usual rental. Thank you. Our remote for the tv needed new batteries, and she went back and returned with the new ones for us. Very enjoyable accommodations. Fantastic view of Gull Lake. They were all very helpful and professional. It was very enjoyable and very relaxing. The cleanliness of the whole property. The kitchen was wonderful and we loved the Jacuzzi. Also the view was outrageous and the BBQ was clean and we'll equipped. Actually we loved it all Thank you for a Great vacation, it was better than any of us expected. We will definitely be back again. Everyone on your staff is courteous and helpful. Great experience. Thank you. An enjoyable experience with no difficulties booking the property and enjoying the accommodations. This was a new company for us to rent from this year. Everything was well organized and ready for key pickup when we arrived. The staff was very friendly and helpful. We have stayed in June Lake for our winter family vacation for 15+ years now. We love the family atmosphere and the Interlaken Condos are our favorite place to rent. It was awfully nice to have snow this year too!! !